Adolf Hitler’s secret mistress, an upstanding member of the British aristocracy, gives birth to a daughter. The child is whisked away at infancy and raised as an orphan. She is protected from the truth concerning her origins, but that doesn’t prevent the remnants of Hitler’s scattered empire from seeking her out as part of a plot to reignite their dream of conquering Europe. Enter into our drama the starchy, conservative Jean Hastie, an art historian and official for the Scottish National Trust. When her best friend Monica is murdered she is determined to avenge her death and to rescue Monica’s granddaughter, Mel, who is missing and the prime suspect in the crime. She soon finds herself embroiled in the neo-Nazi’s conspiracy. Jean sets off to find Mel, traversing crime-ridden London housing projects, the Paris apartment of a former Nazi lawyer, and a chateau in the South of France where a quaint village camouflages a sinister political conclave. 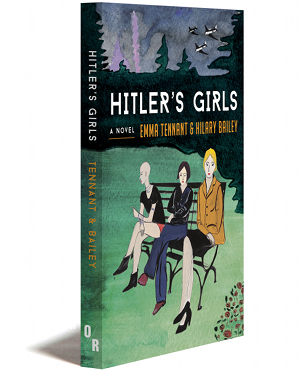 In Hitler’s Girls, Emma Tennant and Hilary Bailey’s wry, atmospheric prose conjures a whirlwind adventure full of international intrigue, subtle humor, and terrifying, timely, political speculation. Emma Tennant spent childhood summers at her family’s Gothic mansion in Scotland. The founder of the influential literary magazine Bananas, her first novel, The Colour of Rain was published under a pseudonym while she was working as an editor for Vogue. Many books followed, including a series of subversive “sequels” to much-loved classics. A Fellow of the Royal Society of Literature, she was awarded an honorary D.Litt. from the University of Aberdeen in 1996. Hilary Bailey is an editor and writer. A former editor of the innovative SF magazine New Worlds and a reviewer for The Guardian, she is the author of sixteen published novels and a short biography. “What are you doing?” Magda says. It is like a hiss, unfriendly. Then she says, “Girls who sleep with gods catch fire, and die.” I don’t answer. How can I? German is a hard and manly language, very precise and not like ours, full of vagaries and half the time you don’t know where you are. But I can’t answer Magda. I’m in a corner by myself, near the long table, with the candles in candelabras waving over all the silver and glass and food and wine bottles. Magda’s hemmed me in. I don’t want to talk to her. Tonight, I don’t want to talk to anybody. I just look at the flames of the candles and say, “Thank you.” She goes away, in the end. Good. We drove here in a fleet of long, black cars. So thrilling. Now there is charming piano music, waltzes by Strauss, or something, all played by the odious Putzi, a giraffe with the face of a frog, if you can imagine it, but I can’t see him and won’t think about him, not on this wonderful, wonderful night. Under the chandeliers, music floating round the room, are the cleverest and most powerful men in the world, with Amadeus, as I call him to myself, the most clever and most powerful of all. He sweeps all the rot and corruption ahead of him like a tidal wave; he is making a new world, better and purer and cleaner. A wonderful spectacle, the men in their medals and orders, the women in their elaborate dresses and jewels. Tonight I am in white, simple as a nun, no jewels, my pure blonde hair swept up with only a gold clip to hold it. A little shiver runs down my long, white back, exposed by the simple gown. Is the evening growing colder, in spite of the candles and the crowd? Or am I, perhaps a little nervous, like a bride on her wedding night? I am silent; I feel alone, somehow, in this great, important party. Suddenly, so quietly, there he is at my shoulder. “Come out with me,” he says. “Walk.” It is almost too great an honour. I can only nod and together we walk through the crowd, which parts for us as we go out onto the terrace. We stand away from the lighted windows, looking out on to the quiet, dark garden. So quiet—just the subdued sounds from inside the room. A little wind, carrying the scent of mown hay. He put his arm on mine. I feel the roughness of his jacket against my bare arm. I screw up my courage. “Tonight,” I say. I can scarcely get the word out. Yet I have waited, waited so long. “Yes, my little one. Yes, my darling,” he says. Then the arm is gone. He is gone. I follow him, treading in his footsteps back into the room. I am dreamy, near fainting. Tonight. My wedding night, I think. The bedroom is gloomy, with thick curtains and a lot of heavy furniture. There are dull old engravings on the walls, showing buildings and people in old-fashioned clothing. Then over the mantelpiece there’s a picture of a naked woman cradling a swan in her lap. The swan is looking up at her, like a pet dog. So silly! Swans are very big and not at all cuddly. Everybody knows that. I have a beautiful nightdress, never worn before. It is satin with lace at the bosom. I have turned off the light but I cannot sleep, of course. Worse, I can hear men crossing and recrossing the hall below, loud voices, laughter and, further off, the constant ringing of a telephone bell. I can imagine the talk, the planning, the study table covered with maps and documents. Will he come? Across a chair by the window lies my white dress, gleaming in the darkness. Above the fireplace that huge painting, shining a little in the gloom. Then, louder voices, and heavy feet on the stairs and goodnights and all the rest of it. And still, I wait. He cannot insist. It is for me to act now. I unbutton his jacket and pull a shoulder free. He takes off the jacket and I pull him down, down, down on to the bed with me. I cover his face with kisses, I smooth his hair. “Are you tired?” I ask. “Never tired,” he tells me. Of course not. Amadeus is steel; he is thunder; he is lightning.